Swineshead Reserves' Rhys Holland and George Swift, of Horncastle Town Reserves, clash for the ball. 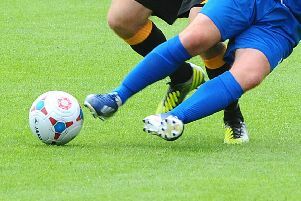 Twice the underdogs held a two-goal lead, at 2-0 and 3-1, against a under-performing Town side. But the home side pulled themselves together to run out 4-3 winners. Adam Dales (two), Josh Wood and Tom Watson rescued Spilsby from defeat after Freiston looked on course following goals from Tom Bates, who scored twice and recent signing, Tyler Bobb. Bates had a mixed day as he was later dismissed for two yellow cards. There was another potential shock at Billinghay where Park United, from Division Two, were not short on confidence. Unfortunately for the minnows ,they got off to the worst possible start when they conceded in the first minute. Despite this early setback, Park United started to get back in the game before another cruel blow set them back when, on 25 minutes, defender Dan Huskisson made a rash challenge in the box, leaving the referee with no option but to give a penalty which was dispatched by Billinghay to make the score 2-0. The rest of the game was very even with neither goalkeeper having to make a save of any mention and Billinghay held on to progrees through to the next round. Billinghay’s goals came from Joe Stainsby and Shane Underwood-Harley. Old Leake and Wyberton Reserves produced an exciting game of football which was decided by a late winner. Wyberton started off on the front foot and they soon forced young goalkeeper, Owen Richardson into a vital save when he turned a goal-bound shot onto the post. Wyberton went close again shortly afterwards when they struck the crossbar, and then the rebound was blasted over when a goal seemed certain. The visitors eventually were rewarded for their bright opening when Shane Brackenbury broke the deadlock when he turned his marker before firing home. At the other end, Old Leake also struck the crossbar and keeper Pete Cook made a couple of fine saves to keep his side ahead at the break. The second half continued to flow with Old Leake starting to look more dangerous and they levelled the tie with 20 minutes remaining. Referee Paul Revell played an advantage when Patryk Kacireck was fouled, and the ball found Adam Abell, who evaded two tackles, before beating the keeper at the near post. The match looked to be heading for extra time until a cross caused confusion in Wyberton’s defence and Abell nipped in to tap the ball home for the winner in the dying minutes to make the final score 2-1. Although Kirton Town were hit for 10 in their home tie against Leverton SFC, the 10-2 scoreline wasn’t a true reflection of the game. For a start the home side had to take to the field without a recognised goalkeeper, as well as calling up four reserve players while their opponents were bolstered by a Holbeach United player, Aaron Eyett, who helped himself to a hat-trick. Swineshead had a routine 5-1 home win against Old Doningtonians with goals from ex-Dons striker Chris Wing, who scored twice, Jack Houghton, Alex Snaith and Ryan Barker. Skegness Town also had a comfortable home win against Coningsby. Max Forman (two), Kieran Elliott and Damian Howland grabbed the Skegness goals while Jack Obriene replied for the visitors. Friskney striker Victor Sibert proved too hot to handle for visitors Fosdyke when he netted four of his side’s goals in a 6-0 home win. Bob Jackson and Adam Waples were also on target for Friskney. Third Division Mareham United failed to fulfill their home fixture against Benington due to a shortage of players, so the Premier side will receive a walk-over passage through to the next round. Fishtoft Reserves travelled to Coningsby Reserves in the semi-final of the Main Ridge Takeaway Reserve Cup, and were dominant from the outset. The visitors were awarded a penalty but they squandered the chance and further opportunities went begging before Coningsby made them pay by taking a half-time lead through Sean Taylor. The second half saw Fishtoft quick out of the blocks and they were soon level within two minutes through Neil Allen. Fishtoft continued in control and they added a second through Jamie Skinner. The tie was then wrapped when Allen played Skinner in for his second to make the final score 3-1. Pointon earned a welcome 4-1 home win against Ruskington Rovers in the Taylors Garages Premier Division. Dom Kew, Sam Husband, Ian Jacquest and Nathan Wilson were the matchwinners while Ruskington replied through Sam Jackson. Railway Athletic stay top of the Taylors Peugeot Division One after a comfortable 6-0 home win against Tetford. Goals from Ollie Walker (two), Jake Portas, Leon Creasey, Steve Appleby and Luke Smith saw off the visitors. Fulbeck United remain hot on the heels of the leaders with a a superb 5-1 away win at Woodhall Spa United, thanks to a hat-trick from Dylan Grocock. Reagan Purvis and Aaron Harrison made sure of the three points. Woodhall competed well and they were rewarded with a Jackson Draper goal, but Fulbeck’s late flurry of goals did the damage. A solitary Giles Favell strike helped Swineshead Reserves to only their third win of the season, easing their relegation fears. Favell’s winner saw Horncastle Town Reserves return home empty-handed. FC Kirton were forced to withdraw from their home match against Fishtoft due to a shortage of players. The league will be hoping the club can turn around their fortunes, despite three players transferring from the club this month. A James Fairburn hat-trick saw Spilsby Town Reserves return home with all three points following a 6-2 away win at East Coast in the Taylors Ford Division Two. Travis Herberts, Dan Smith and an own goal completed the scoring. Scott Dore and an own goal were East Coast’s only reward. FC Hammers were held to a 2-2 draw at home by FC Wrangle. Liam Ingamells and Perry Meshulam were on target for the Hammers. Billinghay Reserves were unable to fulfill their away fixture at Sibsey owing to a shortage of players. This will give the leaders an easy three-point haul. Two goals from veteran Kev Orton kept Wyberton A on course for promotion when they edged out Old Doningtonians Reserves 2-1 at home in the Taylors Vauxhall Division Three. Sam Reed hit the winning goal for Benington Reserves at Leverton and the 1-0 victory helped move his side up into third place.